Norwegian artist Ann Lislegaard presents an off-kilter installation Time Machine, 2011, at the 6th Momentum Biennial which is both alluring and disturbing to anyone entering the windowless room on Gallery F15's ground floor level. This video and spatial work accentuates the biennial's indeterminate (and therefore inaccessible) inquiry into time, place and imagination—harboring the theme and title “Imagine Here Being Now”—and focuses on the future, complementing other contributions by the The Long Now Foundation and Lorenzo Scotto Di Luzio's Untitled, 2011, in the Biennial. Lislegaard's artistic practice continues to utilize science fiction as an experimental platform to inter-splice complex investigations into communication, politics and gender. 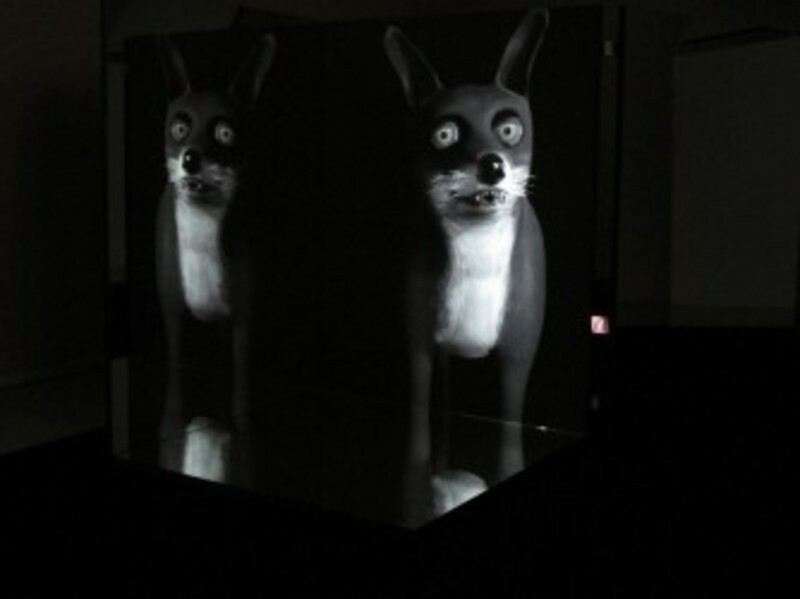 In Lislegaard's project, announcements emit from a stuttering, animated fox communicating via its digitized, fragmented declaratives. The wide-eyed fox tries convey its journey into the future, but words are distorted from the exposé. Symbolically, the fox is a spiritual creature—somewhat parallel to the King's joker, portrayed as the Robin Hood of animals, fighting both for itself and for others with no explanation besides its own hedonism or convoluted sense of justice. Why the fox instead of another creature already linked to historical travel expeditions (e.g. Laika the Space Dog)? The fox remains a universal representation for various cultures: a fantastical entity with wisdom gained through experience, a mysterious messenger, an otherworldly force. Lislegaard's fox is unable to clearly express itself, and one is deliberately at a loss witnessing the feral entity relay its obscure journey, aspiring to maintain a human-like dignity. This awkward phenomenon rolls over into the current state of affairs: to hear too much and everything but without total comprehension. The senses are littered with white noise, the audible and muffled baggage of the past, the present's unreasonable demands. The voice of the fox is unpleasant; it simultaneously possesses an eerie authoritarian tone and childlike commotion—the voice resides between liberated youth and restrained maturity, between coherence and nonsense. The isolated fox is trapped in a fractal-like mirage: a folding mirror box which seems to ingest certain words and phrases from the creature's explanation. Time Machine could be a vacuum eating the animal's personal narrative, leaving only particles as a remainder. The viewer must choose to accept or reject this residue as a significant clue. The visual display of the fox is innocent and amorphous, yet the splintered, aural transmission appears disenchanting and foreboding. Trepidation and mechanical disfunction permeate the work. Lislegaard's work pushes the viewer into a molecular place exuding ambiguous potential because Time Machine seems invested in what or who is not being said and heard—the estranged and squelched. The 6th Momentum Biennial is at three locations this edition and Lislegaard's piece can be found at Gallery F15: Alby Gård, Jeløy, 1510 Moss, Norway.